On Nov. 6, “the ugliness of the last two weeks will be litigated again in the midterm elections,” the Boston Globe said in an Oct. 7 editorial aimed at voters: ‘Now it’s your turn’. A Washington Times columnist, to the contrary, suggested it was time for the Democrat Party to reclaim its lost soul as the party of JFK. “Democrats and Republicans are spinning very different narratives about what just happened in Washington, and voters will, in a sense, be asked to pick which reflect the values of Americans,” the Globe editorialized. 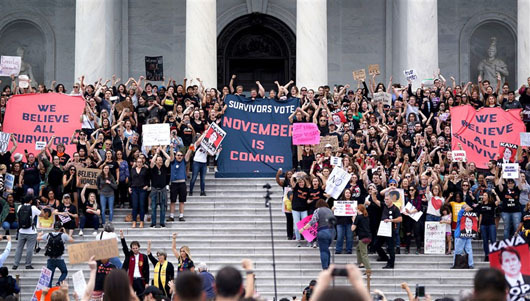 While many Republican voters who feel Justice Brett Kavanaugh was treated unfairly have become “galvanized,” Senate Democrats will “ask voters to embrace a truer narrative,” the editorial said. To illustrate her point, Chumley pointed to the Democratic Party Platform of 1960 versus the Democratic Party Platform of 2016.